Both quicks took their fair share of wickets in the third Test against Sri Lanka, giving the selectors a poser before the NZ tour. 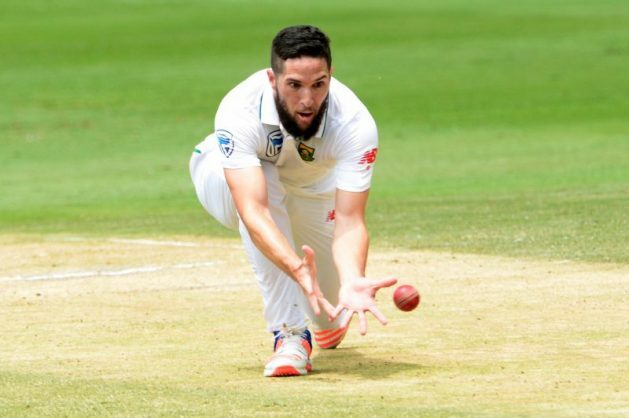 The Proteas’ certainly aren’t complaining about their rookies in the bowling attack, Wayne Parnell and debutant Duanne Olivier, taking wickets in the third Test against Sri Lanka. But they’re also no closer to determining who should be the third quick to support Kagiso Rabada and Vernon Philander. Parnell and Olivier on Saturday shared 11 victims between them in the victory by an innings and 118 runs at the Wanderers. The all-round ability of Parnell, who took career-best figures of 4/51 in the second innings, probably places him in the inside lane to fill Kyle Abbott’s spot. However, Faf du Plessis, the Proteas skipper, is still undecided. “It’s great that they got wickets,” he said. “When we had Sri Lanka six wickets down in their first innings, I had hoped the two would finish things off. The duo did indeed finish off the Islanders’ first innings, before snapping up 7 of the 10 second innings scalps. “The plan is now to make sure that the guy who is selected as the third seamer can get to KG and Vernon’s level as quickly as possible,” said Du Plessis. It’s not really something Parnell and Olivier did in the second innings but at least they could point to results in the form of wickets. “Both of them will readily admit they possibly leaked a few more runs than they wanted to but they got guys out,” said Du Plessis.